Match Day 2 action at the OFC U-16 Championship Qualifier in Tonga. 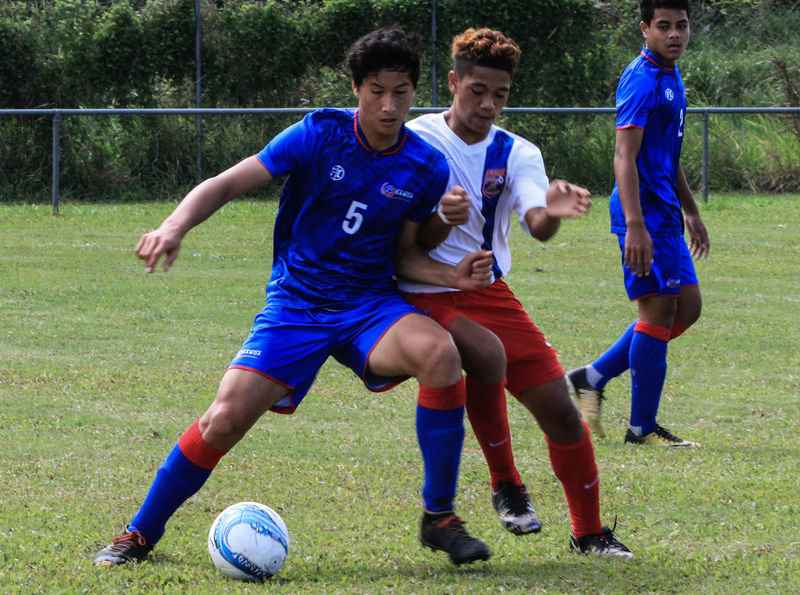 With two-from-two Samoa have put themselves out of reach of the remaining contenders at the OFC U-16 Championship Qualifier, but they’re not a side that will be content with anything less than a clean sweep. That makes Tonga’s job in tomorrow’s closing match a tough one with the hosts having to overcome the disappointment of not being able to follow in the U-19 side’s footsteps and replace it with the fervour that comes with winning in front of home fans. But first local fans will be treated to a face-off between Cook Islands and American Samoa, two sides who have been seen off by Samoa, and held equal standing with Tonga. American Samoa started the competition in lightning form dominating possession against Tonga and earning a two goal lead. It could have been the cushion that led to complacency or perhaps physical preparedness, but American Samoa faded in the latter stages of the second half allowing Tonga to come back into contention. The side then struggled to find a foothold against a strong Samoa side, and despite some flashes of brilliance were completely overcome giving up ten goals while scoring just three. Despite these results American Samoa will be coming into their third and final match with the hopes of finally nabbing the full three points against a Cook Islands side whose trajectory has been fairly similar to their own. Anthony Samuela’s side lost their opener to Samoa before playing out a 0-0 draw against Tonga in a much livelier performance which at times had the home side on the back foot. Like American Samoa, the Cook Islands are keen to return home with some at least one victory under their belts and this final encounter is their chance to obtain that. “We really just need to work on our finishing and our first touches a little bit,” Samuela said ahead of their final game. “We want to put the ball in the net. Ruben Luvu felt like his side has yet to play to their full potential in Tonga and hopes that their final match will showcase what they are capable of. “We’re still looking for that win,” he said. “Our last game, the score, it doesn’t stop us. We’ll look at the mistakes, analyse where we went wrong and try to come back and get a win. In the late match Tonga will try and halt tournament winners from progressing to the OFC U-19 Championship with a clean sweep of the qualifier. Having watched their opponents see off Cook Islands and American Samoa with relative ease, Tonga know they have a touch task ahead of them tomorrow afternoon. However coach Lafaele Moale said the draw with Cook Islands especially, is driving his side to try and secure a win to close out their campaign on a high. “We’re looking at our finishing and our combination play – building up from the back. We have had a lot of chances in our games but definitely need to finish them in our last game,” Moale said. For Samoa coach Martin Tamasese the tournament has been a success but to go home with three wins and the full nine points will be a big confidence boost for the side ahead of their appearance in the Solomon Islands. “All the teams wanted to win. We want to defend well and score goals so we can defend our unbeaten,” Tamasese said.